Smooth operation, even after years of use! 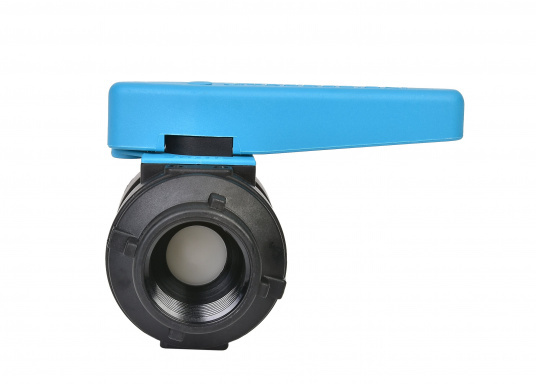 These ball valves are suitable for use above and below the water line. Available in different sizes. TRUDESIGN - Ball valve 1/2"
TRUDESIGN - Ball valve 3/4"
TRUDESIGN - Ball valve 1"
TRUDESIGN - Ball valve 1 1/4"
TRUDESIGN - Ball valve 1 1/2"
TRUDESIGN - Ball valve 2"
Smooth operation, even after years of use! 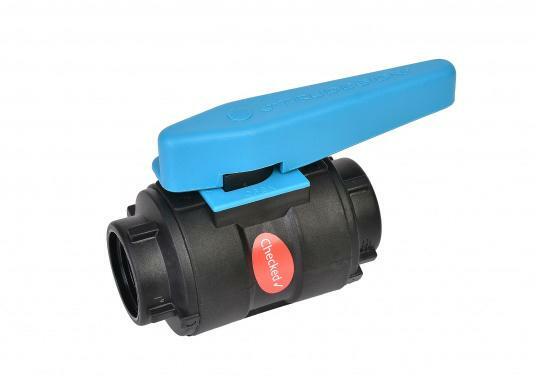 These ball valves are suitable for use above and below the water line. The valve housing is made out of fiberglass-reinforced nylon composite material, which withstands high pressure and has a long service life. To ensure smooth operation for years, the ball and bearing are composed out of PTFE-reinforced polymer plastic. Frost-resistant. Available in different sizes. The technical datasheet mentions that the valve should be mounted using a specific spanner. Is this delivered with the valve or can it be ordered with the valve? Kann man bei Bedarf auch , Kugelhahn, Reduziernippel oder Schlauchtüllen aus Messing mit dem Gewinde von Trudesign Artikel dicht verschrauben?? D. h. sind die Gewinde kompatibel??? Hallo, die Gewinde sind meines Wissens nach kompatibel. Ich würde allerdings keinen Materialmix installieren. Unterschiedliche Materialien heißt auch unterschiedliches Verhalten bei Kälte oder Wärme. Also vorprogrammierte Undichtigkeit. Die Mehrkosten für weitere Teile sind doch nicht so immens, das solche Unsicherheiten gerechtfertigt sind. Gewinde sind kompatibel. Kein Teflondichtband verwenden, stattdessen Loctite 55 Gewindedichtfaden benutzen. Mal auf die Homepage von Trudesign gehen, sehr informativ. Danke für die Infos. Für mein geplantes Abwassersystem - absolut nach aussen abwasserfreie Yacht - bietet Truedesign bzw. SVB nicht alles im selben Material. Borddurchlässe werden alle Kunststoff im inneren muss ich auch aus Platzgründen auf kleine Messingkugelhähne und Verbindungsnippel zurück greifen, wenn ich nicht bei x Liferanten bestellen möchte. Hallo, Kombination mit Bronze-Fittings ist ausdrücklich gestattet von TRUDESIGN. Es werden zwei unterschiedliche Gewinde angeboten, BSP und NPS, ob die Gewinde übereinstimmen muss natürlich geprüft werden. 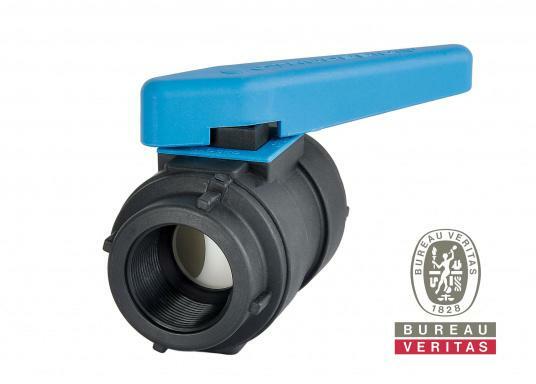 Hier ein Auszug aus den faqs von TRUDESIGN: Can you fit TruDesign Ball Valves to bronze skin fittings ? 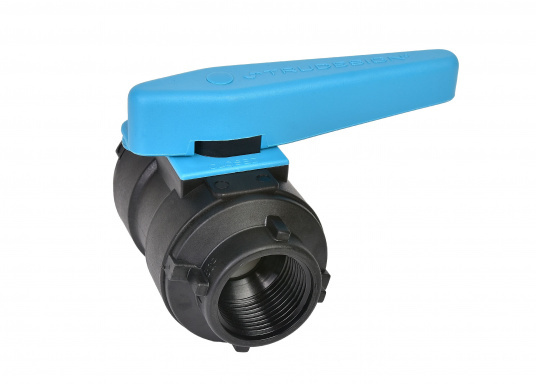 Yes TruDesign Composite ball valves can be screwed onto an approved bronze skin fitting. First the thread on the bronze skin fitting must be identified to match the TruDesign Ball Valve (either BSP or NPS). In the case of an old existing bronze skin fitting you must check that the bronze is not pitted or corroded from electrolysis and is in good mechanical condition. Siamo in grado di ordinare articoli non presenti sul nostro catalogo prodotti all'azienda True Design. La prego di inviarci una email all'indirizzo info@svb-marine.it con i codici degli articoli a cui è interessato. Le invieremo la nostra migliore offerta. I am interested to install Trudesign skin fittings and valves to my sailboat (French flag). Is this material CE approved? is the CE mark printed on the valves body? The Trudesign website indicates that only one type of valve ((3way valve) is CE marked, all other apparently are not. Thanks for any clarification. Ich habe zwei alte Kugelhähne gegen Truedesign 1 1/4 Zoll ausgetauscht. Rohrdurchmesser für Schlauch ist aber 32 statt 38 mm wie vorhanden. Gibt es Fäkalienschläuche im 32mm innen? 1 ½ Zoll Ventile haben 38mm Durchmesser! Daher umtauschen!! Umtauschen auf 1 1/2 Zoll dann passt auch dein 38 mm Schlauch. wie oben beschrieben wäre es am besten den 1 1/4 " Hahn gegen 1 1/2 " umzutauschen. Wenn Du unbedingt 1 1/4" verbauen möchtest mußt Du einen Schlauch 32 mm innen verwenden. Den gibt es natürlich auch. In jedem Fall brauchst Du als Übergang vom Schlauch zum Hahn den jeweils passenden "Anschlussfitting". Außerdem überprüfen ob das andere Ende des 32mm Schlauch´s auf die Toilette bzw. Fäkalientank passt. Peut-on enlever la poignée pour faciliter le montage? Je ne pense pas. Voir la doc constructeur peut être. Je ne vois pas dans quel cas la poignée peut être génante. Très content de ces valves après 1 an d'utilisation. OUI il faut enlever le petit bouchon rond au centre de la poignée avec le bout d'une lame pointue ou un tout petit tourne vis (comme pour le bouchon rouge ou bleu d'un robinet de lavabo) et la vis cruciforme est dessous. Merci pour vos réponses. En effet, dans le Sharki, il faut enlever la poignée de la vanne pour pouvoir la visser sur le passe coque des toilettes (manque de place). Hi, I'd like to know if the threads are standard international (metric) or else, and if the standard connectors we can find in any french shipchandler can fit in. Bonjour, je voudrais savoir si ces vannes ont des filets standards métriques ou pas, et si elles acceptent les raccords standard que l'on trouve in any shipchandler in France. Easy to login, search and order process on the website. Excellent courier service to Sicily and the product quality is great. Good looking quality product, I'll be fitting it in a couple of weeks. Well constructed .Good size range. Built to last.Handle easy to turn and strong.